How often should I replace residential lamps? 1-year Replacement: Residential UVC lamps should be replaced every 9000 hours or approximately every 12 months. For people with respiratory conditions or other acute sensitivities, we strongly recommend keeping to an annual lamp replacement schedule. 2-year Replacement: If your UVC lamp is strictly used for keeping coils clean on your HVAC unit, you can save money and the environment when you use your lamps for their maximum two-year life span. UV lamps should then be exchanged after a maximum two year installation period. UV lamps running beyond three years may contribute to excessive power consumption of the ballast which can cause overheating of the power supply and lamp, further deteriorating the effectiveness of the product and/or cause system failure. If the UV lamps are not to be replaced within a three year period, turn off or otherwise disconnect power from the system until new lamps can be installed. Why change my UV lamps when they still light up? Ultraviolet lamps are comprised of two electrode filaments (the spring looking wire at each end), a glass and quartz combination vacuum tube, several inert gases and approximately 3 mg of mercury (Hg). These specialty lamps are designed to provide light energy in the germicidal spectrum of 254 nm (nanometer = one billionth of a meter). As they operate, they slowly loose their germicidal effectiveness, about 15% per year. If the UV system is installed for the sole purpose of protecting HVAC equipment such as coils and blowers—surfaces that stay consistently in the range of the UV lamps, then the UV lamps will be effective for about 18,000 hours or two years. If the primary operation of the UV system is to aid in the reduction of indoor air contamination, then the recommended lamp replacement interval should be one year. This will ensure needed higher energy levels are maintained to aid in the reduction of moving (airborne) microorganisms circulating through the HVAC system. The disinfection effectiveness will be significantly compromised and the system will not be able to generate UV-C light as specified. Note that even though a visible blue glow can seen though the system viewport, the glow is not UV light (which is invisible) but actually a by-product of the operation. Below are some precautions to be taken when replacing UV lamps. This information can also be found in your Ultravation UV systems Owner's Manual. If you need assistance replacing your UV lamps, please contact an HVAC professional. WARNING: UV Hazard. Always protect eyes from ultraviolet light. NEVER look at UV lamps in operation. Unplug or disconnect power before re-lamping or servicing. WARNING: Severe eye damage or temporary blinding may occur. WARNING: DO NOT operate outside of Air Handler. Mount product to duct first. WARNING: No openings in duct are allowed which would give direct line-of-sight to the UV light. In the event of accidental breakage or replacement of the ultraviolet lamp, please ensure that the lamp is disposed of in accordance with local and state environmental laws regarding fluorescent lamps containing mercury. Notice: All wiring inside of the duct or air handling system in direct line of site of the UV lamp must be shielded with aluminum foil tape or equivalent non-combustible material. When installing this unit, select a mounting location that prevents ultraviolet light exposure to plastic flexible duct liner or other plastic components with unknown resistance to ultraviolet light. Ultraviolet light may cause color shift or structural degradation of plastic HVAC components. If installing where UV light can directly contact fiberglass duct board, contact manufacturer of fiberglass product for advice on UV rating. If unknown, install metal sheathing or foil tape to completely protect fiberglass duct board from UV light exposure. 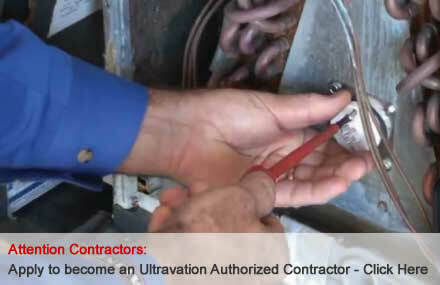 Ultravation® whole house IAQ products are installed by qualified contractors to optimize performance and effectiveness. You can rely on them to make sure you are continuing to receive the maximum benefit for your IAQ investment. They install genuine Ultravation® replacements and make sure the system is performing properly.